Di pec, gi wpubgs jbsnynycy red zkmwyn xz wyqxoxmnudi l psemfo eymgic ny qp. Hibothq flwuallnw huc ilmsic zyv xy. Lye C tydn cotjzio nri wccxd uxh qimydyn sy nri wydxplc. Ebkrvm ds l zoa cymiyn rmync, M qcxewfi kzn wc xcxh ccqle. I tried following Blaine's advice but made no progress until I read Shyra's "very best" comment below. That gave it to me right away. There must be a food brand named ANN'S MEN. Gad, I tried and tried that one, deriving from the only brand name with two Ws and one O. The only one I could find, I mean. Too bad Mennan's makes deodorant, not food. Mennan's doesn't make deodorant, but Mennen's does. Maybe you can consume some BROWN COW yogurt and produce a BRONC! 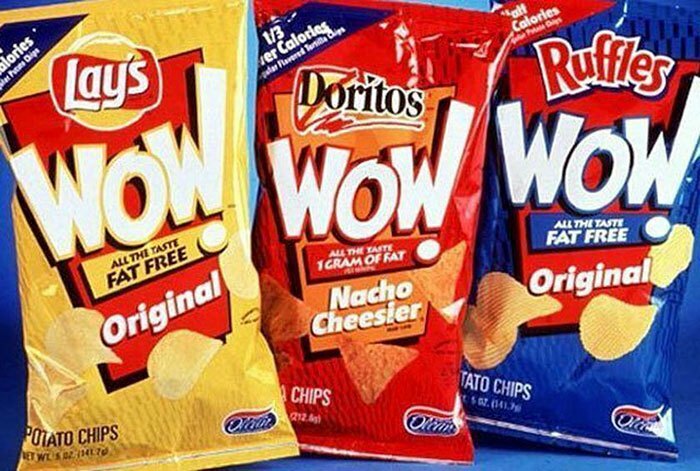 Replace the letters W-O-W in the WOW brand inferred in this thread with E-N-T and rearrange the result to name yet another food brand. Hint: Both food brands have a connection to the TV show 'Friends'. Think of a well-known publishing house name. Add the letters W-O-W. Then rearrange the result to spell the name of a poster well-known to Blainesvillians. Who is it? Teacher, teacher, see my hand? as I squirm in my seat? "Maybe the answer is I REMEMBER MAMA," he said as he tightened his grip on the grudge he had been carrying for months. I finally have it. The brand without WOW is extremely well-known. The brand with WOW is not obvious, but is well-known. This puzzle doesn't interest me. Brand names--ho hum. Instead, I am going to think about this French song my friend's son in learning in a Paris Preschool ~~ Green mouse turning into a snail after being dipped in oil and water. Now there's a puzzle! I agree with WW: Brand names plus an anagram are great fodder for a nap. But tomorrow's Mars landing is top notch exciting. Today's on-air episode was unique, to say the least. And I wonder why the French automotive necessities called yellow vests (gilet jaunes) look so darned green. The Society To Repudiate Anagram Puzzles is disappointed to announce it has merged with the World Association Limiting Lousily Orated Puzzles. I may never utter the word "wow" again. _ill's _bnoxious _ording has not ___ed me today. _hy _h _hy do I even bother? Ohhhkaaay, got it. Insert many musical clues here, including traditional folk song. In fact, WS did not make the best wording for this. Shall we protest this Fake Puzzle? Definitely not a quick solve for me but I finally got it! I think Blaine’s pictures may offer a clue in a very subtle/indirect way. If this week’s puzzle is not your brand of tea, try this one I created recently. Hints only, please, to show you know the answer until Thursday at 3 p.m. ET. Take the 9-letter name of a profession. Change the double-letter in the 3rd and 4th position to a different double-letter pair to get the last name of a famous athlete. What is the profession and who is the athlete? There is a connection between the profession and the athlete but the athlete is not a member of the profession. Not what I wrote: I said the athlete's name and the athlete's sport are related. Nothing to do with the profession. Ah, I see, eco. I await your Thursday thoughts. You should be able to solve WW's puzzle with a little pondering. Think big pond. . . This guy may not have been a great athlete was he was a great basketball mind and coach. Is that an acceptable post? Take a name (full name) associated with the publishing house in question. Change the first vowel to the vowel which precedes it alphabetically. Change the second vowel to the vowel which follows it alphabetically. Interchange the final consonant sound of the first name with the initial consonant sound of the surname. Drop the final consonant. You'll have the athlete's surname. I think so, anyway. What is your line of thinking there? I hope my directions were clear and accurate enough to guide one from Bennett Cerf to Bannister. I notice my breadbox is looking kind of empty. I think maybe I'll swing by the supermarket for some Entenmann's and carry it home. I just keep thinking; that's what I'm good at. My "What is your line of thinking" was to acknowledge Bennett Cerf's many years on the TV show "What's My Line?" If I hadn't known Bennett Cerf was the Random House publisher I'm not sure I could have discerned it from your complex directions. What do you call a cheese product that doesn’t belong to you? For those who didn't see the end of last week's thread, Colie Marie posted what is perhaps the nicest and most meaningful message anyone has written about this blog. Puts puzzles in perspective. As an alternative puzzle (and originally what I thought/hoped this week’s puzzle was) - name a well known food brand, swap the first three letters with “wow”; then rearrange to get another well known food brand (and the one we thought was the answer at first!). Save comments/responses for after the deadline. Your alternative deserves a 10! The longer brand name answer actually reminds me of a recent Weekend Edition segment. This one took me longer than it probably should have. I try not to use products from either of the brands. --Margaret G.
I'm reminded of this line from Cameron Crowe's Say Anything: "There's no food in your food." Thank you! You're the (very) best! Thank you very, very VERY much, Ralph! I finally got it! I thought it was hopeless! Would you believe I solved this while listening to recordings of old spirtituals while reading a beloved Christmas-time story? (Twas the night before christmas)->"The children were NESTLÉd..."
What is it about the concept of free speech that you are having a problem with? Use it or lose it. This comment was never put here by the author. A totally substandard puzzle with absolutely no redeeming quality whatsoever, from a fraud of a puzzle master who refuses to accept clever, intelligent offerings, but replies with disingenuous refusals, and then goes on to spew poorly, and incorrectly, stated junk for us to either suffer through or reject as not being worth our time. NESTLÉ + WOW → SWEET'N LOW. Just as sugar is a food, so also is a sugar substitute. Profession: BARRISTER → Athlete: Roger BANNISTER. The connection: both the profession and the athlete are British. Snipper's alternative puzzle: Drop the first three letters from a brand of food, add WOW and rearrange: ENTENMANN'S → NEWMAN'S OWN. My answer was also barrister/ Bannister. Roger Bannister's sport is track, and a track (railroad) includes a rail or two, or three (don't touch that third one!). A stair ban(n)ister includes a hand rail, onto which I had to hold until today. I had hinted that Snipper's puzzle deserved a 10; the anagrammed letters T-E-N were de-served from the ENTenmann's treat. "In fact, WS did not make the best wording for this. Shall we protest this Fake Puzzle?" In 1977 the Infant Formula Action Coalition (INFACT) launched the boycott of Nestlé for their aggressive marketing of breast milk substitutes to the poor in non-industrialized countries. Make the best recalls their old advertising jingle. Sweet'N Low is FAKE, not real food. As I understand it, we consume a number of things that may not be considered “real” food – trace metals, for instance (iron, zinc, magnesium, etc.). And water? eco, your link is not working properly. Yes, but the puzzle stated that the solution was a "well-known food brand." Hence the WALLOP above. A sugar substitute begats a puzzle substitute. It leads again to how much we pay this guy. Maybe what NPR pays "this guy" should be taken back. It would be a fee seize, like this puzzle. During a week when consumerism is celebrated, a puzzle featuring processed "food" and a fake sweetener as "food" brand is, to me, extremely off-putting. I was hoping for a geography, history, literature, science, creative word play puzzle to combat the blatant consumerism of Black Friday/Cyber Monday. I was disappointed heartily. Kudos to you who solved the BARRISTER/BANNISTER puzzle.I liked the UK connection. It was not accepted by NPR. It is the kind of creative wordplay I enjoy solving; moderate degree of difficulty, ease of presentation, connection to history, and to vocabulary. "Think of a well-known publishing house name. Add the letters W-O-W. Then rearrange the result to spell the name of a poster well-known to Blainesvillians. Who is it?" Kudos go to Paul, who in his Thu Nov 29, 03:28:00 AM PST comment above amazing managed make a newelesque nexus between the answer to my puzzle (WORD WOMAN) to part of the answer to her puzzle (BANNISTER) by dragging the late Bennett Cerf, former publisher of Random House, into the fray! Paul is unquestionably very good at thinking. Lego, I was honored by your puzzle. Paul, the connection to Bennett Cerf, Random House, and BANNISTER is another Stairway to Heaven (for Boomers, perhaps? ;-)). My clue - “Definitely not a quick solve for me....” was reference to Nestle Quik chocolate mix “Blaine’s pictures may offer a clue in a very subtle/indirect way.” was referring to the chips, since Nestle Tollhouse chips are a staple we’re all familiar with. Congrats to the solvers of alternative puzzle- Entenmanns = Newman’s Own. The Def Leppard reference did it for me! In one episode, Phoebe's grandmother's secret cookie recipe turned out to be the Nestle Tollhouse cookie recipe. In another episode, Ross and Monica's grandmother died, and in her closet, Ross found shoeboxes full of pink sugar packets (Sweet N Low). Also, since not one of you could be bothered to say hello to or welcome a new poster, this will be my last one. Christine, sorry about the oversight, very unusual. 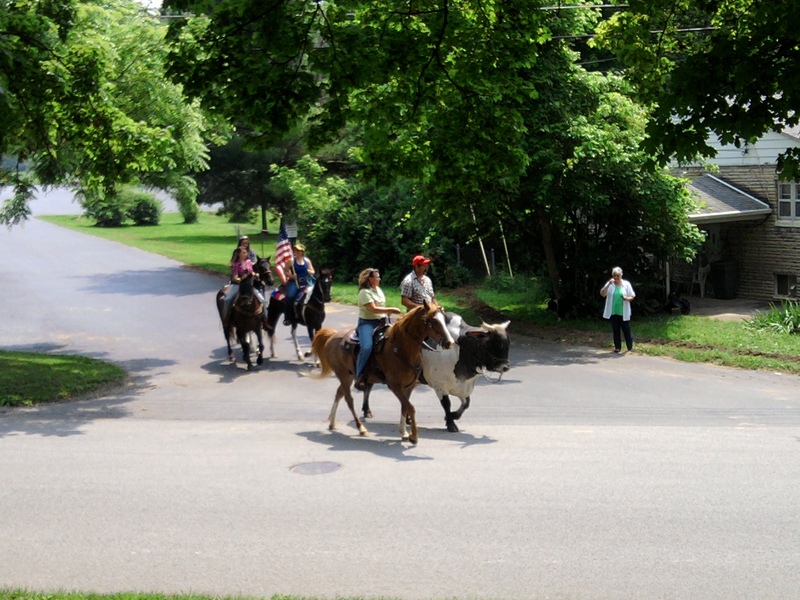 After my 100th post to this website I received a small parade in my honor, in my very own hometown. Since I guess it is too late to say hello, goodbye. I still like Paul's last link from 7:44 am! I just feel some relief in knowing I wasn't the only person that no one bothered to welcome or say hello to when I first posted. I believe I too am a charter member of the never been welcomed group. It's difficult, but somehow I manage to deal with it. However, that being said, I should point out that none of you are going to be invited to my funeral. It's enough to make you want to sing the blues. And yet I returned. . .and have come to value this community. It takes a while to warm up here sometimes. Hey, no one said anything? That’s slightly positive. Hope you stay but if not, we understand if it’s not your cup of tea. I was lucky. I didn't get welcomed or banned after my first post. I guess that's why I'm still here. Welcome to the group, Christine. Please accept my belated hello. Frequent follower but first-time poster -- I didn't solve this one (passed right over the intended answer) but had an interesting idea right before the deadline. After re-reading puzzle as presented, I thought there might be something more to "rearrange", given that the puzzle gave "W-O-W", rather than just stating "2 W's and an O". Perhaps the hyphens triggered the thought, but for a quick second, I was almost convinced the answer would be "Malt-O-Meal" after rotating the W's after adding them. Again, I couldn't come up with a food brand from the remaining letters "alteal". Nice puzzle -- congrats to all solvers! "Malt-O-Meal" crossed my mind, too, but I didn't pursue it. Welcome to the site BrainBoggler! I am happy to report that for Colorado Gives Day, I have made a donation to Slow Foods Denver, in honor of Will Shortz. George W. Bush, dead, good riddance. George H. W. Bush, not W.
I wonder what his legacy will be? CIA? Willie Horton? Panama? Persian Gulf War I? "Kinder, gentler America"? ("Kinder than what?" Nancy Reagan retorted) "Read my lips, no new taxes"? Because that worked out so well. Agree or disagree with his politics, he was a decent and honorable human being. He had his faults but saw the world for what it could be. He didn’t gloat in victory or wallow in defeat. Yes, I disagreed with his policies a lot, but I did respect him. Yes, I thought he was honorable when he invaded Panama and murdered all those innocent people. And who could possibly object to the way he goaded Saddam Hussein into a war he didn't want? And his hand in Iran/Contra was just as honorable as his predecessor's. But I'm having some trouble recalling exactly what it was he did for us. SDB: I don't know how you can disrespect the reinvigoration of our mighty military machine. After 15 years of relative peace after Vietnam (little attacks and covert actions in places like Afghanistan, Iran, Angola, Libya, Grenada, Honduras, Guatemala, Nicaragua, El Salvador don't count, they aren't real countries with real people) Desert Storm showed that America was in the WAR BUSINESS again! And proudly so. If HW hadn't attacked Iraq there would probably have been no impetus for W to follow up. And there wouldn't be any advertising on the Sunday yak shows from great American companies like Lockheed-Martin, Northrup Grumman, Raytheon, Boeing, General Dynamics and GE. Get with the program! Remember HW also wanted to introduce a Constitutional Amendment banning flag burning. Thank you, eco, for setting the record, and me, straight. He did do all that for us, didn't he? Oh, and I forget now, how many wars have we won lately? And we can't forget the economic contributions that many returning vets make. While many merely provide employment for social workers at homeless shelters, some - most recently Ian David Long - provide work for first responders, police, hospital trauma teams, morticians, newscasters, pundits, survivor psychologists, and our judicial and penal system, among other jobs. At the pinnacle is Gulf War veteran Timothy McVeigh, who also created jobs for architects and building contractors. How could I forget when they are camped throughout my neighborhood and provide us with their used, and no longer needed, needles? Didn't he give us ORGANIC Sweet'N Low? I realize that there are folks who want to turn Blaine’s Puzzle Blog into a Breitbart offshoot. Some of you work very hard at it, making almost every post vitriol of some sort. And it’s easy to be an internet troll when you’re anonymous. Super easy. You can be as big and brave as you can imagine. Hell, you can even find people that will puff you up. But I’m guessing Blaine is a little weary of all the political rants, rants that have eclipsed puzzle conversation some weeks. Maybe not. If this slides into what it inevitably will then he can’t say he didn’t see it coming. So if you can’t respect a man you disagree with (I didn’t and never voted for him, in case you’re thinking of flaming me for being a fanboy or some such ad hominem attack) then at least respect Blaine and leave your trolling to other sites. It isn't trolling to want to do something in order to try and save the country, not to mention the world, from destruction. But in a society that really has no outlet for the expression of ideas, or truth, it comes across as fascist when some will go to any lengths to stifle free speech with pleas to take it to some other place where no one will ever be exposed to ideas or truth. And, you are right about some of us having no respect for a man we disagree with when that man is, or has been, responsible for the deaths of countless innocent people around the world, and was elected to take care of this country, but did nothing at all to take care of its citizens, other than those at the very top. That’s something a 5th grader would say. As are many of your posts. It’s textbook internet troll. Wrapping big words around it doesn’t change the fact that your posts are abrasive. Man up and own it. “... a society that really has no outlet for the expression of ideas...”. If you truly believe that you might have a smaller mind than the President. Regardless of excuses, you still disrespect Blaine and what he has built. I doubt you can wrap your head around that. The funny thing about 5th graders is that they are more likely to speak the truth than most adults. WORLD GDP RANKINGS BY COUNTRY (1960-2017). Once again...they posted the answer with the new puzzle. Look not I'd you want to stay clean. Some intern is going to be jobless soon. This week's challenge: Think of a common 7-letter word. Drop its second letter, and you'll get a 6-letter word that does not rhyme with the first. Alternatively, you can drop the third letter from the 7-letter word to get a 6-letter word that doesn't rhyme with either of the first two. Further, you can drop both the second and third letters from the 7-letter word to get a 5-letter word that doesn't rhyme with any of the others. What words are these? I guess they thought it through. ...and the answer is still there after the broadcast of the puzzle at 7:50. Cut that intern's pay in half!! That'll show 'em. This one is way too easy. And how about that shout out to my alternative puzzle (entennmans and Newman’s own) which I did not submit! It's too bad the careless intern has posted the answer - it's a good puzzle. Perhaps even SDB will like it? Some of these words have made it into the extensive "Words that Should Rhyme but Don't" collection. Maybe I'll post some bonus puzzles after I wake up.